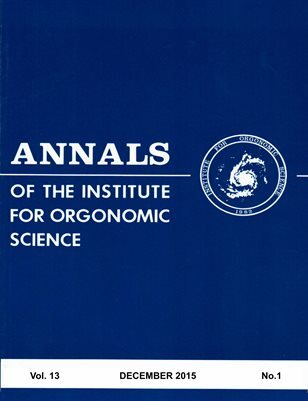 ORGONE BLANKET AS A COMPLEMENTARY SUPPORT IN THE TREATMENT OF AN ATROPHIC-CANCER BIOPATHY. 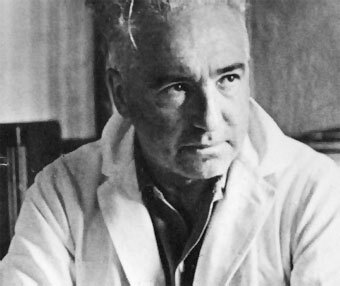 Results of the treatment of a pancreatic adenocarcinoma with the support of an orgone blanket of the type devised by Wilhelm Reich are reported and discussed. At eight months from the diagnosis of the disease, the total-body PET CT scan no longer detected any pathological localization. 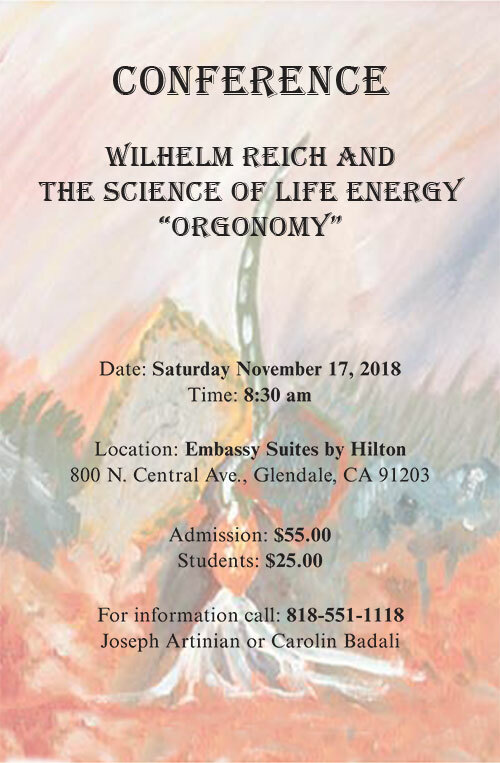 In his book The Cancer Biopathy Reich reported several cases concerning the use of the orgone therapy for the treatment of biopathies (1) in humans, and specifically in atrophic and cancerous ones. In the text it is detailed that large masses of tumor cells dissolved, sometimes so fast that it became a problem, at times lethal, to dispose of the dead tumor cells and T-bacilli (2) through the kidneys, the liver, and the lymphatic system. As a research group,The Campania Felix, we decided to apply Reich’s experiences in consenting patients. We started around two years ago by treating an atrophic-cancerous biopathy, and other biopathies, with an orgone blanket. 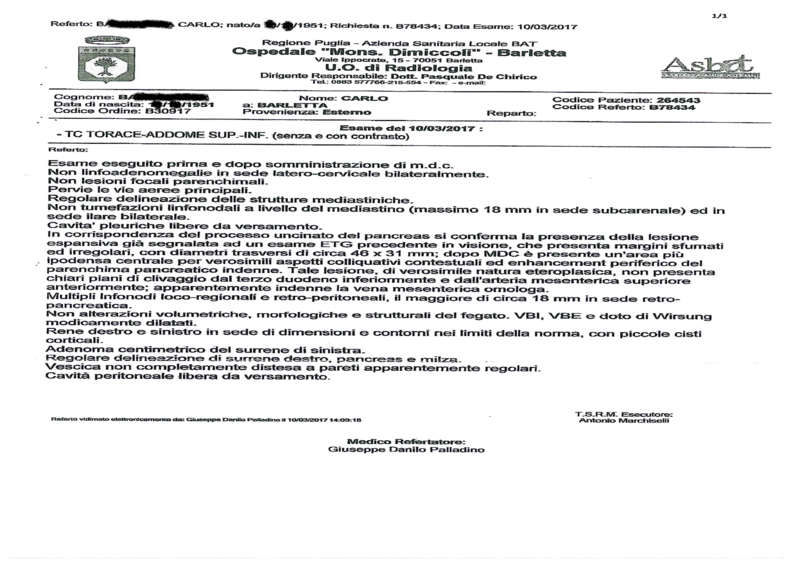 Being that orgone therapy is not officially recognized in Italy, we used it as a complementary support tool of the official medical therapies prescribed by the National Health Service (SSN). In this article we report a case that, due to the unusual nature of the results, resembles some of those reported by Reich himself. 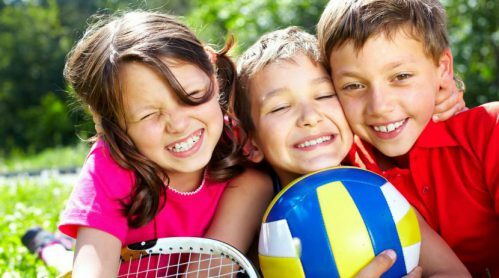 The diagnoses, clinical examinations, prognoses and therapies were those prescribed and carried out by SSN’s personnel, and were done independently from the activity of our group. EGDS (esophagus-gastro-duodenumoscopy): an extrinsic compression of the gastric wall. Echo of the abdomen: lesion of the uncinate pancreatic process of 3-3.5 cm. Oncological markers: within the limit. Chest-abdomen CT (March 10, 2017) (see Illustration 1): lesion of 46 x 31 mm to the uncinate process of the pancreas, unclear cleavage plan with the upper mesenteric artery, free venous vessels. Multiple loco-regional and retroperitoneal lymphadenopathies, the longest was of 18 mm in the retro-pancreatic site. No hepatic lesions. Centimetric adenoma at the right adrenal gland. 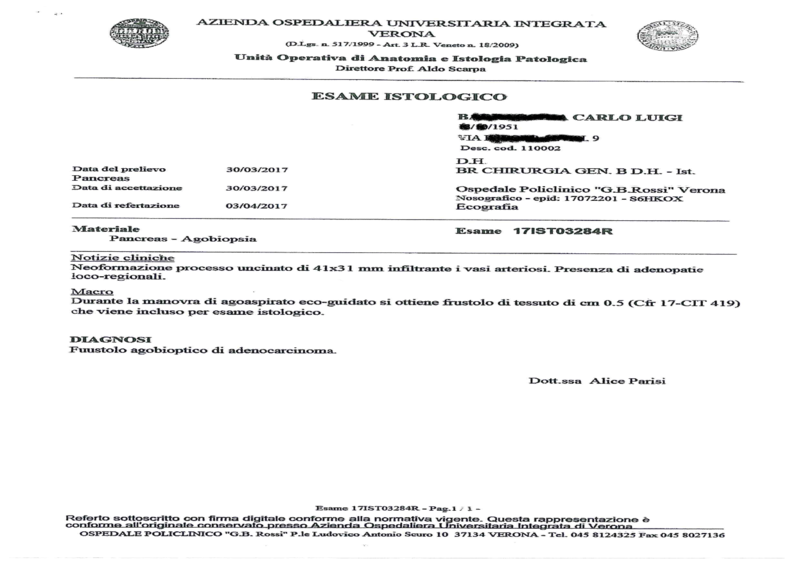 The patient then went to the Pancreas Institute of the Integrated University of Verona, Italy, on March 21, 2017, in good general conditions. He reported hyporexia from January and steatorrhea in close relationship with meals from a week. The clinical examination revealed a neoformation in the uncinate process of 41×31 mm infiltrating the arterial vessels; and presence of regional adenopathy. Percutaneous biopsy of the lesion was performed on March 30, 2017, with histological diagnosis of agobioptic frustule of adenocarcinoma (see Illustration 2). 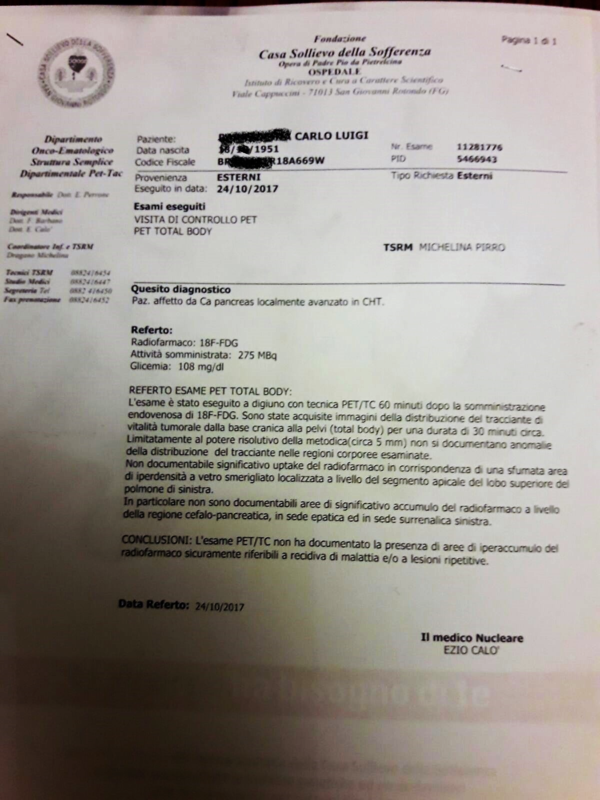 On April 09, 2017 he was admitted at the Oncology Division of the Casa Sollievo della Sofferenza of San Giovanni Rotondo, Italy, where on April 11, 2017, he underwent a CT scan with contrast that confirmed the presence of a voluminous expansive formation of the pancreatic uncinate process, max 48 mm. It was indissociable from the horizontal portion of the duodenum which seemed to be at least partly incorporated. The lesion also infiltrated the upper mesenteric artery and licked the upper mesenteric vein. A tenuous thickening of the perilesional mesenteric adipose planes was associated with small scattered lympho-nodal nodules. More voluminous lymphadenopathies were located in celiac sites, up to about 15 mm, and in the hepatoduodenal ligament up to about 20 mm. The remaining pancreatic parenchyma appeared slightly dis-homogeneous with mild ectasia of the Wirsung duct. In the hepatic parenchyma, in the single arterial phase of the study, there were multiple and minuscule hyperdense focal points, with a maximum size of 7-8 mm, of suspected repetitive nature. Substantially unchanged a 20 mm hypodense nodulation in the context of the left adrenal gland. The neoformation was judged to be inoperable, and a life expectancy of about 30 days was reported to the patient’s family. At this point the patient started using the orgone blanket, which we assembled (see Illustrations 3 and 4), one hour a day the first week, two hours a day the second week, and then for four hours a day. Chemotherapy with Abraxane and Gemcitabine was administered to the patient as follows. On July 11, 2017 the patient had CT performed with contrast. Compared to the previous exam the following was observed in the medical report: "Modest volumetric reduction of the known heteroformed expansive lesion of the pancreatic uncinate process, currently with a maximum diameter of 44 mm and with a more hypodense structure as per contextual necrotic-regressive phenomena. Reduced ectasia of the Wirsung duct upstream of the lesion and intrahepatic bile ducts. Reduced sizes of the lymphadenopathies: in the celiac site where they currently do not exceed the centimetre, and in the hepato-duodenal ligament where currently the largest one measures 1.5 cm. The small focal lengths with enhancement in the arterial phase appear almost completely disappeared from the liver. Left adrenal nodulation unchanged". Chemotherapy was continued as follows. It should be outlined that the use of the orgone blanket (four hours per day) in this and in the following phase was never discontinued. The CT scan with contrast was repeated on September 13, 2017 with the following results as reported in the medical notes: "It is observed a further volumetric reduction of the known heteroformed expansive lesion of the pancreatic uncinate process to 38 mm with lower enhancement of vascular structures. The ectasia of the Wirsung upstream is also reduced, while the calibre of the intrahepatic bile ducts and of the hepatocoledoco, currently of modest size, appear to be superimposable. The size of lymphadenopathies in the celiac area is unchanged and currently do not exceed one centimetre. In the liver, no obvious pathological focal lesions. Mild adrenal hypodense nodulation reduced to 17.5 mm. In the pulmonary area, only the presence of a shaded area of ground glass hyper-density of about 10 mm at the upper left lobe was present. Micro-nodulations hypodense against the left lobe of the thyroid". Chemotherapy was continued as follows. 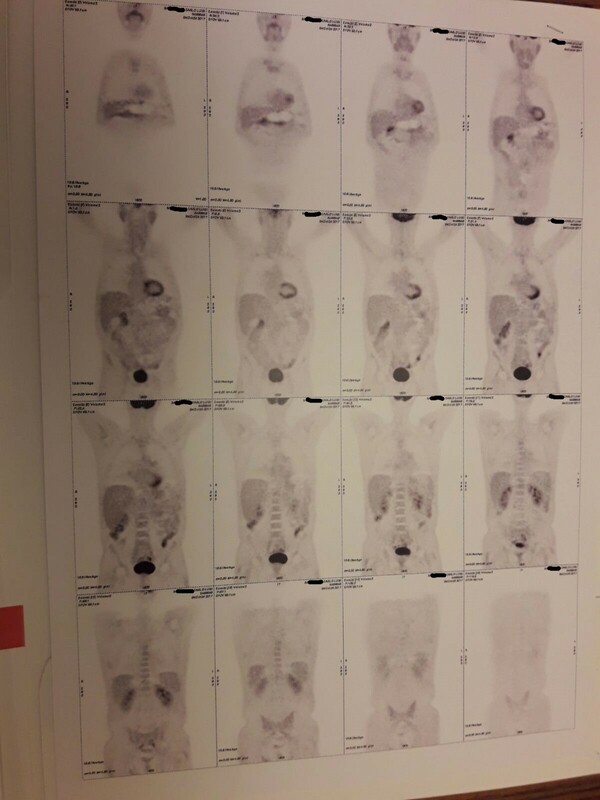 On October 24, 2017 PET Total Body CT scan was performed with the following results noted (see Illustrations 5 and 6): "ANOMALIES OF THE TRACER DISTRIBUTION ARE NOT OBSERVED. CONCLUSIONS: PRESENCE OF AREAS OF HYPERACCUMULATION OF THE RADIOPHARMACEUTICAL REFERRABLE TO A RECURRENT ILLNESS AND/OR RECURRING LESIONS IS NOT OBSERVED". From the above results it can be observed a very clear improvement in the history of pancreatic cancer that is presently recognized by the scientific literature as one of the most aggressive and dramatic cancer pathologies. The improvement was clearly evident with the disappearance of both the liver focal points and the pancreatic mass. We did not find in the literature similar results with the use of chemotherapy only, and it is possible that the complementary support of the orgone blanket has been decisive for this resounding healing process. This can be explained by the observation that the orgone blanket produces, similarly to the accumulator, a concentration of orgone (vital) energy. This is then absorbed by the organism when it comes into contact with it, thus providing a generalized vagotonic effect and an increase of the body temperature. Microscopic observations show a "biological recharge" action on the red blood cells that appear progressively healthier, or more swollen, and characterized by well-defined contours and a characteristic bluish luminescence. In this way, the energetically-charged red blood cells are able to destroy the tumoral cells and the T-bacilli, whose presence was first discovered by Reich. These entities are always present in this type of pathology it appears. The cancer tumour is only one of the symptom consequences of the decrease of the energetic level of the whole organism (known to Reich as a biopathy). The orgone therapy improves the general energetic state, and can lead to the remission of a large variety of pathologies. It is important to remind readers in this context that a simple Reich test on living blood allows a very early diagnosis of the cancer pathology, thus enabling determining situations of being "at risk" possibly years before the actual tumoral cells can develop. As a research group we are presently planning to perform the Reich blood test on our patients and that will be the subject of our next paper. A biopathy is a global disturbance of the energy system of an organism which results in illness. T-Bacilli are a claimed disease causing microscopic vesicle only the size of a few viral particles which Reich found occurred in blood when living tissue breaks down. It has been claimed to be seen with very strong light microscopy (see Reich W, The Cancer Biopathy). 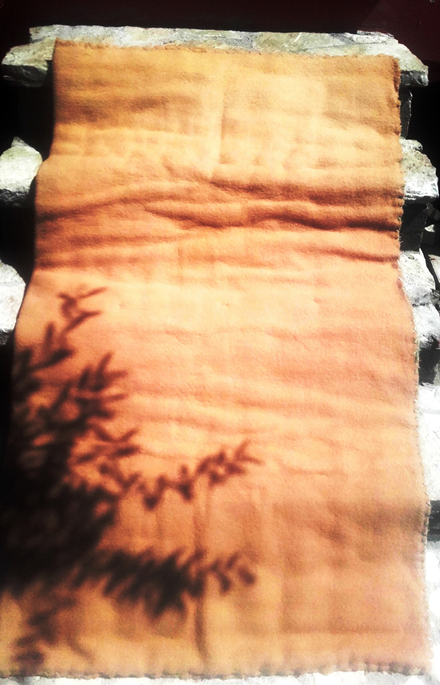 Figure 3 – Orgone blanket. Size 80 x 140 cm, weight 3 kg. 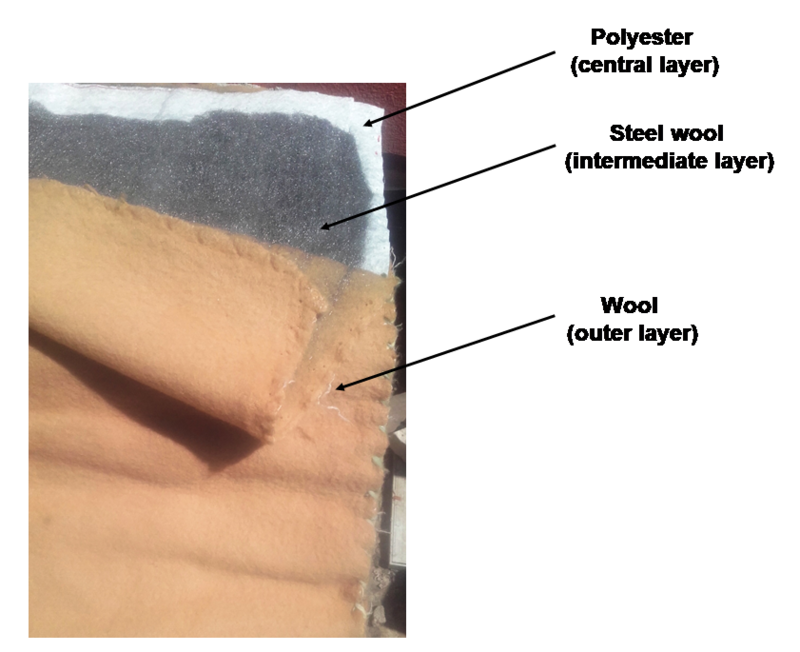 The blanket is made by 2 external layers of wool; 2 internal layers of steel wool, separated by a layer of polyester. In use it is placed with the metal layer innermost to the patient. 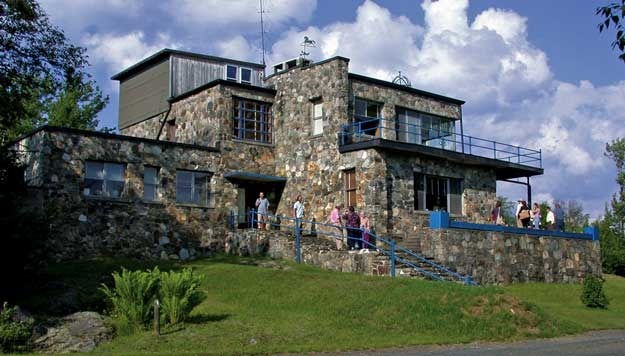 Campania Felix Group - who has written 1 posts on The Journal of Psychiatric Orgone Therapy. The Campania Felix is an independent research group based in Italy and is consisting of the following components: Tommaso Aprile, oncologist Salvatore Del Prete, orthopaedic surgeon Fiorenzo Carlino, physiatrist and acupuncturist Isabella Angelone, physiotherapist Antimo Cammisa, physiotherapist Fulvio Cusani, physiotherapist Nicola Dello Iacovo, physiotherapist. Cancer cells are more sensitive to heat than healthy cells and it is possible anything that increases body temperature would kill them. Future controls should be tried to sort out which effect of the orac is the one that is helping. Even better results would probably have been obtained if the chemotherapy had been ommitted. Chemo is so damaging to the already sick organism that it only adds to the stress the orac needs to overcome. If I ever am diagnosed with cancer, chemotherapy is one treatment I would not try. I have been diagnosed of a prostate cancer in november 2014.The oncologist had adviced me radiotherapy and hormonotherapy sessions that I have refused. For three years I only cured myself with bitter almonds of apricots (16 a day) and it seemed to work. I have continued my bodybuilding workouts and I felt fine until that day of september 2017. During a nap after lunch, I had covered my chest with an orgone blancket. When I woke up, I have felt pains in my chest and in the back. During three weeks, I got a persistent and strong fever which didn’t come down. I had given up my bodybuilding workouts. I lost about 13 kilos. I decided at last to see a doctor. It was a week-end time and my fever had grown so dramatically that he decided to hospitalize me.had shown that my PSA had gone up dramatically (360 instead of less than 4!) and the scanner indicated that I got skeletal metastases all along the chest and the spine. I got six sessions of chemiotherapy. I could stand them very well thanks sylibum marianum pills that I got in a shop of “natural products” and thanks sessions of “Bol d’Air Jacquier” that at did at home after having purchasing one device. Now, I feel well but recently my PSA (that had come down to 12 has grown up again to 70 and my oncologist has ordered a new scanner for the next week.. I think I have made a big mistake. I should have to continue my exposition to the orgone cushions. I have reread the Cancer Biopathy and I realized that I have charged my blood of orgone, and it has allowed my blood cells to fight the T-bacillis. But after that fight, my organism was exhausted, and that explains why I lost those twelve kilos. But, as I thought the cushions were the problem, I didn’t.